This is in response to your memorandum of January 28, and followup of April 16, requesting an interpretation of the labeling requirements of the Hazard Communication Standard (HCS) with regard to containers of pesticides. In your memo you question whether OSHA can cite an employer when an unlabeled container of a pesticide is found in the workplace. Your conclusion appears to be that OSHA cannot cite since the pesticide is "subject" to EPA pesticide labeling requirements, whether the label is present or not. If OSHA is certain that the chemical is a pesticide -- and that the lack of a label is therefore a violation of EPA's requirements and not OSHA's -- no citation would be issued, but a referral would be made to EPA. However, the CSHO [Compliance Safety and Health Officer] cannot objectively ascertain that the container holds a covered pesticide unless an appropriate pesticide label -- with an EPA registration number -- is produced by the employer. Existence of such a label needs to be established for OSHA to be certain that the chemical is an EPA-regulated pesticide. This is particularly important since many pesticides are used for other purposes (e.g., carbon tetrachloride and ethylene dibromide). 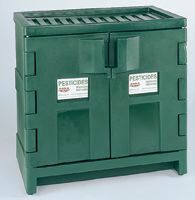 Get pesticide and flammable storage cabinets at Safety Emporium. the employer can demonstrate that the chemical is subject to labeling requirements of EPA (or other Federal agency) by producing the appropriate label. If the appropriate pesticide label is produced after the citation is issued, we will withdraw it upon proof that the chemical is covered under EPA regulations. Questions has arisen concerning the need to label pesticides according to the Hazard Communication Standard (HCS). The standard states in section (b)(5) that pesticides, as defined in FIFRA, are not required to be labeled under the HCS when "subject to the labeling requirements" of FIFRA. This clearly states that HCS labeling requirements can not be cited for containers of pesticides, even if the pesticide containers are not labeled in accordance with FIFRA since the pesticides are still subject to the FIFRA labeling requirements. Statements have been made that OSHA should cite under the HCS if pesticide containers are not labeled in accordance with FIFRA. It does not appear that these statements would be able to be supported. Confusion has apparently arisen due to an erroneous reading of (b)(5) as stating that the exception applies when labeled in accordance with FIFRA. Since section (b)(5) clearly does not state this, the labeling exemption under the HCS would not be affected by the failure to label in accordance with FIFRA. Label your hazardous materials with signs and labels from Safety Emporium. Preliminary discussion on this issue has been held with Orlando Pannochia of the Solicitor's office. It is requested that a legal opinion be rendered. Please contact Jim Johnston of my staff (FTS 596-1201) if there are any questions.